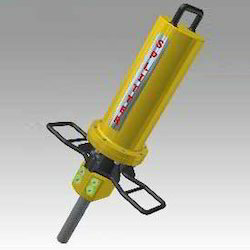 Hole Size Required: 1 3/4", 1 3/4, 1 3/16"
Minimum Hole Depth(inch): 12, 12", 39", 18", 26"
Minimum Hole Depth: 26", 12", 18"
Hydraulic rock splitter is a hydraulic control demolition method, non explosive non blasting good for hard rock marble granite demolition. Hole Size Required (inch): 1 3/16"
- The supper-high-pressure oil-driven oil cylinder outputted by the pumping station generates gigantic driving power, which can split the object to be split to preset direction after mechanic amplification. - Single Person Can Easily Use To Perform Operation. - Hydraulic Rock Splitter Produces Force Of 415 Tons. 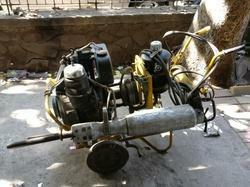 - Hydraulic Rock Splitter Can Work Under Water. - Powerful On All Types Of Ground Strata. Description Prodrill hydraulic rock / concrete splitter is a machine which is used in mining work of construction stones, the secondary breaking of large rocks and the partial or integral removing concrete facilities. It can split the objects into many pieces in the natural cleft surface.